Want to Live in a Real-Life Waterworld City? The so-called Freedom Ship, a floating city of thousands, is an idea that has been tossed around for a while. 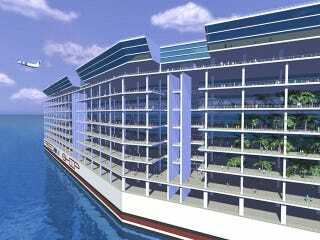 Now the Freedom Ship company has a new set of designs for the floating urban space, which looks sort of like a giant mall parking lot, and sort of like a really giant Love Boat. Here you can see the new design of the ship. The designers estimate they'll have it built in three years. Here are some of the specs on this giant ship city. * 18,000 living units, with prices in the range of $180,000 to $2.5 million, including a small number of premium suites currently priced up to $44 million. * A ferryboat transportation system that provides departures every 15 minutes, 24 hours a day, to 3 or more local cities giving ship residents access to the local neighborhood and up to 30,000 land-based residents a chance to spend a day on the ship. * A World-Class Medical Facility practicing Western and Eastern medicine as well as preventive and anti-aging medicine. * A School System that gives the students a chance to take a field trip into a different Country each week for academic purposes or to compete with local schools in numerous sporting events. For example; The Freedom Ship High School Soccer team plays a Paris High School team this week at home and an Italian team next week in Italy, while the Freedom Ship High School Band presents a New Orleans Jazz musical at a concert hall in London. * An International Trade Center that gives on-board companies and shops the opportunity to show and sell their products in a different Country each week. * More than 100 acres of outdoor Park, Recreation, Exercise and Community space for the enjoyment of residents and visitors.